I wish I could say I was all cool like this girl when I listen to audiobooks, but alas, I am not. That said, I do have headphones strung around my neck at all times and I spend inordinate amounts of time listening to books on tape. In fact, I may be one of the oldest Audible listeners ever as I have thousands of titles in my library. I pulled this list together so that I could remember the business books that I have listened to and enjoyed. Some of these I had already heard before writing this post, and some I am excited to hear again. You will notice that there are no bad reviews, that is deliberate. I had some real dogs that I couldn’t even get through, but I just deleted them and moved on. I tried to clump them together in some kind of understandable fashion depending on what kind of motivation and knowledge I was trying to get from them. For example, I started listening with Gary Vaynerchuk’s passionate Crush it and ended with Jay Baer’s practical Youtility, with all different kinds of books in between. 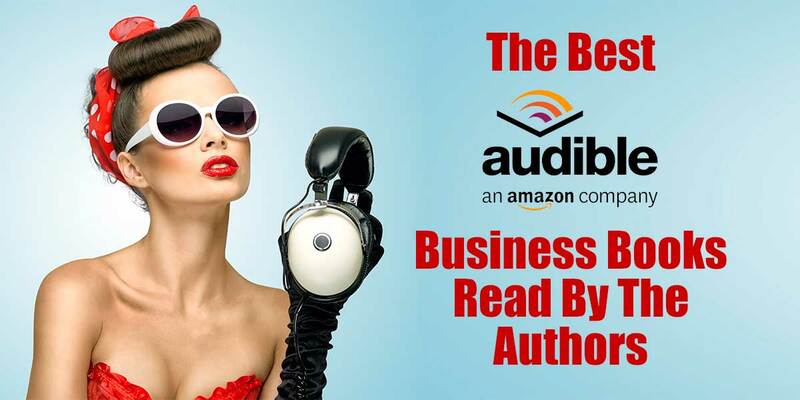 All of these Audible business books are worth a credit to hear and I really do recommend them! Last but not least, I received no compensation for these business book reviews and will receive no affiliate income from them since Amazon hates Colorado (oh, did I say that out loud). Because I am a busy mom AND a business owner, I have to sneak in time to listen to business Audiobooks when I can and my favorites are the ones that the authors read themselves. Now, these are business people who are not professional voice actors so they are not always perfect. I don’t ever mind that as I would rather hear amazing words right from “the horses mouth” as it were. When you head on over to Audible you are going to see some mean comments about the fact that the authors are not perfect readers. If you are like me and looking for business help and advice, ignore those people. It seems that there are just some people whose delicate ears are harmed by non-professional readings and they have to be vocal about it. Some even say they loved the content and hated the author which seems a little strange to me, but who am I to judge! Best Quote : Too many people don’t want to swallow the pill of working every day, every chance they get. I started this post with Gary Vaynerchuk because I really changed my way of thinking when I “met” him on his first book tour talking about how to Crush It. I heard him speak in a room of just about 75 people, when he was schlepping around to tiny venues selling his new idea and I was immediately smitten. To really get the feel of how cool he was before he became a really big deal, check out his keynote from way back then http://video.garyvaynerchuk.com/keynotes/blog-world-expo-2008. His audiobook is absolutely motivating and will get you all fired up to do “something”. I am blessed to have a passion for marketing…if you know what your passion is you will love it! The best part is when he starts to “veer off the script” and adds to the thoughts from the book. I have never met Barbara Corcoran in person, but I have watched many of her keynotes and a few of her Shark Tank episodes. I am not as a big a fan of that show as you might think being a true entrepreneur, but I love that her decisions are made based on her intuition combined with practical business knowledge and experience. If you are interested in learning about sales and how to have determination if the face of obstacles, this is the book for you. Ms. Corcoran’s take on how to succeed in business by working hard and using skills that she learned from her mother to build a multimillion dollar business. Her reading of this book adds greatly to the power behind her words and I really enjoyed the format of switching back and forth between business and childhood autobiographies. Best Quote : The problem with infinity is that there’s too much of it. I actually read this book in paperback before listening to it on audible and many of the ideas in it have stuck with me for years now. I love the idea that you can be the best in the world at something and that your mission should be achieving that as a goal. That there will always be obstacles to overcome and that if you are not willing to go all the way then you shouldn’t even start. Hearing Seth read this book was great! I have talked to him a number of times over the years on email and he is genuine across all every platform with the message of growing your own tribe, building your own networks and trying to be the best that you can do. I have a confession to make…Malcolm Gladwell is my favorite audio book reader and author so this review probably will be a little biased. I just love the pacing and tone of his reading and then the content from his books that he presents is awesome. David and Goliath reminds us that just because something bad happens or that we seem to have a disadvantage in some kind of situation, there are good things that come out of which we never could have anticipated. If you are in business and are having a little down period, it is a great inspirational book without being all “rah rah”. There is no specific marketing advice, just a great one for mindset, motivation and recovering your drive and determination to change any setback or obstacle into a strength. If you get your feelings hurt easily or want to defend a position of not doing a ton of hard work, skip this book. BUT if you are interested in how to grow your business through dedication and hard work, Grant is your guy! My favorite quote is, “What if the only thing standing in the way of your greatness was that you just had to go after everything obsessively, persistently, and as though your life depended on it?” That is the kind of dedication that you need in the short run to have an amazing life in the long run. I know that it is popular to try to work a 4 hour work week or to have an overnight success, generally anything worth doing take a bit of effort. Grant is an effort guy and I listen to this book any time I need to get FIRED UP! Okay, I have listened to almost everything ever put out by Mr. Tracy and I had a super hard time deciding which one to put on the list. It was a toss up between this one and the Success Mastery Academy which is not available right now to purchase on Audible but which is really amazing. My favorite quote from this book is “do first things first and second things not at all”. Over and over again he whittles away at all the extra stuff that we add to our day to “feel productive” and helps you to define what would make the most the effect on your business if you could just get real and accomplish it! It was funny, when I first started listening to Mr. Tracy read his stuff, his slow and measured pace drove me a little nuts. I am a more excitable, hyper listener and that was a little tame for my liking. BUT now that I know his voice and have listened to hundreds of hours, I wouldn’t trade him for the world!!! I had heard of Joe before this but had not had a chance to check out any of his content. I think this is because he is couple of rungs up the ladder of me in who his customers are (mainly catering to brands). That said, I really enjoyed listening to him. If you are just getting started with your content marketing strategy this is a great comprehensive overview of the entire content marketing process. While it is a little dated now and some of the references are not current, if you are looking for a way to get started and practical advice about how to present no many different channels, this book will help. Joe’s presentation style is awesome. The book stayed interesting and personal because of how he read it! I got this book because Jeff was blazing all over the interwebs with new his title, the Art of Work and I thought I would like to hear something else that he had done first. Because of all the interviews that he had done on Podcasts, I was used to hearing him speak and really enjoyed his reading of this book. If you are a struggling writer experiencing doubt about your craft, this is a great book to start listening to! Jeff has a calm and reassuring manner that lets you know everything is going to be alright and that you “got this!”. I don’t want to like these guys because they wrote Freakanomics which bashed my friends the Realtors (unfairly in my opinion), but this was super good! I think that this book is in my Top 10 critical thinking books of all time. Unlike their first two books, this one digs deep into why and how they started thinking about some of the concepts they present in their other books. This sideways thinking is super interesting to me and I have to say, this book flew by listening to it! There were lots of examples and deep dives into WHY they started thinking about the things they published. While I have heard that much of this content is available on their podcast, I am not a listener so this was all new to me and I liked the structured format that got me thinking. Stephen read the book and I really enjoyed listening to it! I really enjoyed this book…(disclosure, I grew up in a stoic old world Pennsylvania town and many of the concepts that Ryan talks about just seemed like common sense to me!) I particularly like how he gave examples of real world stoics, current (Barack Obama) and past (Abraham Lincoln) and brought their tenacity and grit to life. His reading greatly enhanced the book for me. If you are at a sticking point in your life and need an “atta girl” or “this too shall pass” like most of us entrepreneurs need, this is a great listen to get you motivated again! I heard Jay speak about this topic at a conference I attended and was super excited to listen to this book (I can’t imagine how I missed listening to it when it came out!) It was awesome to hear Jay “talking” even more about the subject, especially with how good his delivery is! This book was published in 2013 but not many of the examples have changed because they are mostly based on providing a great service that people will want to use over the long haul. So there you have it, my list of my favorite Audible business books read by the authors! I will add to it when I find other great ones that I like! Thanks for the great list! Just what I needed to help me make some quick purchases on Audible. Appreciate your effort! YAY so glad it helped Jadd!! !